Transport is important. It is about access - and access is vital. It is also a difficult thing to measure. To get the whole picture about how well transport serves its core purpose, it is not sufficient to list all the times people got on a bus or bicycle. However, how people get around is also important. Those quotes come from last month’s DfI publication Method of Travel to/from school by pupils in Northern Ireland, 2017/18. If you have never heard of Travelwise, you are not alone. Levels of public awareness in the scheme was measured in 2008, 2011 and 2014 and consistently hovered around 14% - although there was more recognition for some of its individual schemes, such as Walk to School Week. The real problem, however, is one of effectiveness. DfI is trying to get fewer pupils driven to school by their parents and, as part of their Active and Sustainable Transport aims, more to walk, cycle, use public transport or, at least, carshare. According to the February DfI figures, for the last academic year, there has been no great change in children’s transport to and from school over the past five years – and, if anything, more people are using their car. Among primary school pupils, almost two thirds (65%) were driven to/from school by car/van/taxi and just over a quarter (26%) usually walked to/from school. A further 9% of pupils travelled to/from school by bus, while less than 1% of pupils cycled as their main mode of transport to and from school. These results are similar to 2016/17, however there has been a decrease in walking and conversely an increase in those travelling by car since 2013/14. Among post primary pupils, 50% travelled to/from school by bus as their main mode of transport and a further 31% were driven by car. Under a fifth (16%) of pupils walked to/from school while a small proportion took the train (2%). These results are similar to 2016/17, however the longer term trend shows a decrease in walking and increase in car travel since 2013/14. 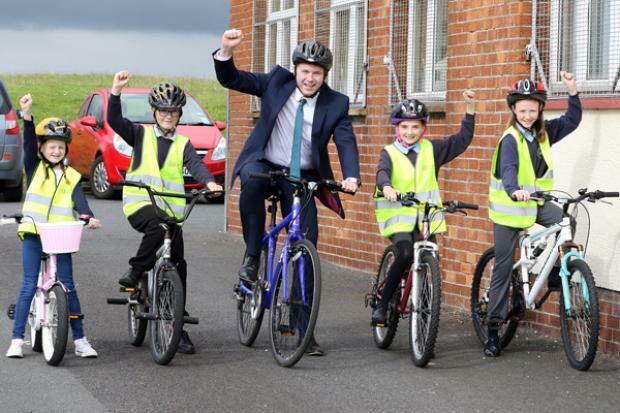 Just over a quarter (26%) of primary school pupils walk or cycle to school as their main mode of transport compared with 16% of post primary school pupils. These results are similar to 2016/17 when 29% of primary school pupils and 18% of post primary school pupils walked or cycled to school as their main mode of transport, however, there has been a decrease in walking and cycling for post primary school pupils since 2013/14. The repetition of phrases in bold (formatting per Scope, and not the report itself) tells the story. These are the key results from the paper and the picture they paint is dispiriting. In addition, the number of pupils who cycle to school is so vanishingly small that DfI records it as 0% for both primary and post-primary settings. Schools are one of the three key audiences for Travelwise and its efforts to change transport habits (along with commuters and employers). For long-term, meaningful change in how people in Northern Ireland get from A to B, they are perhaps the most important audience. It should be noted, however, that the increased use of cars and decrease in sustainable transport options between primary and post-primary schools does not necessarily represent a downward turn in desired behaviour over time. Distances between home and schools tend to increase from primary to post-primary, and this may well explain the change. This itself, however, explains how important convenience is when it comes to managing trends in transport use. There are several reasons to change transport habits in Northern Ireland. The Northern Irish economy is rather dependent on Belfast. Depending on who you ask, this is a weakness or implicit criticism, or a natural consequence of the city’s size and geographic location. Regardless of whether you would prefer a greater spread of jobs/productivity, or an embracing of the city as a place of work and business, no-one is a fan of congestion – and Belfast is creaking with cars. Several times in recent years, it has been branded the most congested city in the UK, with costs to the local economy well into the millions of pounds. In early 2017, two of its main arterial routes – the Lisburn Road and Ormeau Road – were both in the top ten most congested roads in the UK. It even makes a dent in rankings of high congestion in Europe and, indeed, worldwide. That concern is only a narrow look at the various concerns associated with having too many cars on the road. There are impacts that are economic, social, environmental and also health related – a miserable commute can have negative affects on mental health and wellbeing. Moira Doherty, Director of Public Transport at DfI, said: “The draft Programme for Government sets out a clear ambition to transform how we travel by increasing the number of people walking, cycling and using public transport. The case for changing transport habits in Northern Ireland is a good one. There is a level of will among politicians and civil servants. However, not everything we are trying appears to be working, at all – so things need to change. This is a difficult job. Again, transport is about access, but that is an easier puzzle to describe than to solve. Northern Ireland has a large rural population, public finances are already stretched, and crises that (directly) involve health and education tend to take priority. However, if we want people to move away from using cars and onto other methods of travel, alternatives need to be as feasible – meaning, frankly, convenient – as possible.